Can the creative or artistic process be applied to beer? In some instances, creativity, or artistry if you prefer, can be immediately recognizable, or visible to all. In others, it can be subtler, discernible only to the knowledgeable. Does this make one more creative than the other? One of the questions that this magazine has frequently asked, (and answered) is “can creativity be applied to anything?” The Rhode Island School of Design has been answering this question since its’ inception. So let’s ask one more, rather peculiar question. Can the creative or artistic process be applied to beer? After exhaustive research, I say, emphatically, yes! Evidence of beer production dates back 5000 years to the Sumerians of ancient Mesopotamia. In fact, the Sumerians even had a goddess of beer, with the revered beverage being brewed by female priestesses. 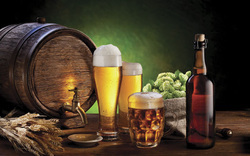 “Modern” beer, brewed and seasoned with hops, barley and malts dates back to the Middle Ages. Rhode Island history may not date back thousands of years, but in its short life, the state has a record of creativity (think the industrial revolution), second to none. As Rhode Island re-invents itself once again, it is looking to tourism and hospitality – and what could be more hospitable than offering a visitor a unique, craft beer? At my count, we have at least ten breweries in the state, each with their own brew-masters, taste experts, quality specialists, graphic designers and packaging experts. The creativity of these artisans is amazing. In true Rhode Island fashion, the beers are designed with an eye (and a nose) towards pushing the boundaries of (literally) taste, smell and something referred to as “drinkability”. In fact, one brewery describes a particular beer as “approachable”. Labeling and packaging is, of course, of paramount importance in what is now a fiercely competitive market. Just take a look at the labels, logos and marketing campaigns of our local brewers to truly understand the imaginative minds that are part of the craft beer revolution. Let’s not forget the resourceful marketing professionals and their inspired writers. Beer terminology has become as complex (and in some cases similar to) what until now has been reserved for the world of wine. Words like heavy, creamy, complex, toasty, nutty, light, peppery, hoppy and rich are all used to stir the imagination and stimulate the taste buds.